AGRITOURISM MONTE CEVA in Cà VECCHIA (comprised of large tracts of nature reserve) is encircled by 50 hectares of forest that is part of the Euganean Hills Regional Park. The historic and beautiful, Catajo Castle, of which the complex was once a part, is only one kilometer away. The restoration of the Monte Ceva - Cà Vecchia Complex was completed in 2004. The ‘casa colonica’ houses two apartments on the second floor. The two, are known as ‘NOCCIOLO’ and ‘QUERCIA’. 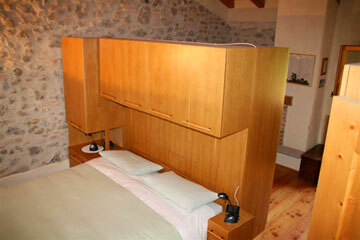 Both of them are equipped with screened windows, fireplace, air-conditioning, a TV, as well as a VHS/DVD player. Both have lovely kitchens. 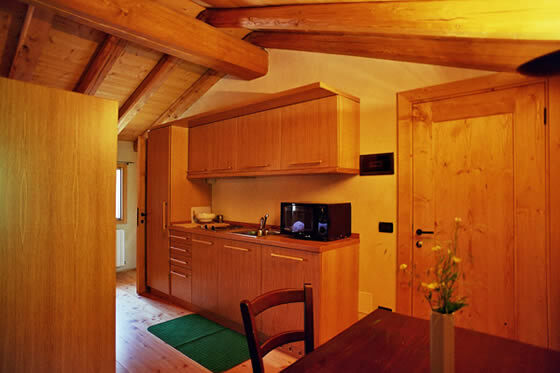 Nocciolo has been designed as a studio and Quercia as a one bedroom apartment with a comfortable kitchen/ dining area. 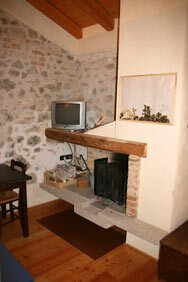 Located on main floor are the dining-room, professional kitchen, and main fireplace. The Herbarium of Monte Ceva is kept in the first floor meeting room of the former barn. And, the ground floor is available to guests for workshops and experiments. The turret serves as an ideal observatory for animal watching. The restoration makes use of green architecture. This includes: airy roofs, and eco-friendly natural lime plaster. The plaster used in the living-room has been mixed with straw from the farms organic plantations. Central heating and sanitary water to the three units of Monte Ceva are provided by a Biomass Boiler, this allows the re-use of the pruning by-products cut from our own trees here, on the farm. On the roof, instead of getting walled-up, the top portion of the chimney has been left open to allow small birds to take shelter and build their nests within. The premises are easily accessible as they are located only 3 kilometers from highway exit Terme Euganee off of Autostrada Padova-Bologna (A13). 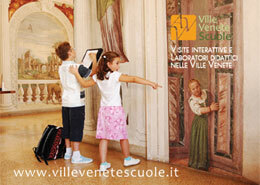 We are located 3 km from the towns Abano and Montegrotto, 13 km from Padova, and 30 km from Venice. Within the estate, there are three paths of different lengths and difficulty levels. Each path has been provided with signage that give directions to (and show illustrations of) the botanical species present within the estate. In the former barn, beside the lodgings, is kept the Herbarium with those species of Mount Ceva present upon the farm. The study of these species was commissioned by the estate and has been carried out by Professor Noemi Tornadore of the Geobotanical Institute, Padova University. Monte Ceva and the surrounding areas have been classified as the most thermal area north of the Po river. Rare species such as the Opuntia Compressa and the Sempervivum Arachnoideum are native to the area. Spring flowering is an UNFORGETTABLE spectacle to behold. A stay at Monte Ceva - Cà Vecchia is especially recommended for visitors who wish to feel the peace of the environs and who also enjoy seeing the fallow deer which often come to quench their thirst at the fountains which flow beside the buildings. This location would also be ideal for those persons who would like to be within a short distance from a magnificent cultural site of great historical and artistic interest. In even the hottest summers, Monte Ceva remains temperate. This is thanks to the ‘micro-climate’ that exists around the estates privileged situation within its small valley. Though many thermal pools and spas are also located in the immediate vicinity of our estate for those who crave a little soothing heat. 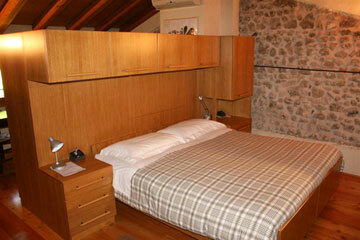 Nightly rates vary from 50 to 120 Euros. All rates include: Organic Continental Buffet Breakfast, taxes, weekly linen service and the use of our bicycles for your enjoyment. *These services should be requested at the time of your booking. Upon request, high-chairs and cribs are available (for children up to 3 years of age). 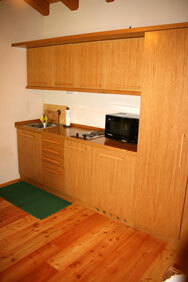 Use of washing machine (to be shared among the other apartments) is available to all our guests. Under special circumstances we can make arrangements for a personal shopping service. *These services should be requested at the time of your booking and may have an extra charge. We kindly ask that all arrivals be between 1500 and 1900 hours. Please confirm arrival time prior to your check in date. Check-out time should please be no later than 1100 hours. Unfortunately, we are not allowed to host a number of guests exceeding the number of beds we have available. We require that 30% of payment be made at the time of booking. The remainder to be paid in cash upon arrival. We accept payment in form of Postepay, Bank Deposit or Transfer and Cash. to receive our proposal of activities !